Rating: 3/5 Shots of fine brandy, to cure the bullet wounds. Before I start singing the praises of this film it is important to note that I went into it blind, without seeing the trailer. Writing this review is the first time I watched it and it has completely changed how I now think of the film. You will note in my review below that the thing that impressed me the most was the mystery presented around the character…had I watched the trailer that would have been taken away, along with a whole load of other reveals and action sequences in the film that I really really enjoyed. I’m changing the rating now because of this. (and yes, yes, I know that the trailers are outsourced and it’s not strictly the film’s fault…but the studio still gets sign off and shouldn’t be showing their major plot points off like that in the damn thing). The action film is back, it well and truly is. No one is relying on shakycams or cut editing here, which drives me absolutely nuts, if the acting isn’t strong enough to demonstrate a compelling and exiting fight Hollywood’s answer now is to jump cut the life out of it and hope the epileptic fit inducing series of elbows and grunts will distract me from the fact that I don’t have a clue what I’m seeing! But John Wick is better than this, Taken 1- I mean John Wick(!) is better than this, The Punish- I mean John Wick is smarter than this! The movie doesn’t hold your hand and lead you through the action with tracking shots following an invincible titan through a wave of harmless henchmen; it does the bravest thing I’ve seen a fight scene do in years- it stays still, and the reason it does this is because it has an actor capable of pulling off the action. Yes, that’s it; the camera stays still and shows you the bloody fight. It shows you the punches and it shows you the kicks and it does it with an elegant and lethal grace that Keanu pulls off exceptionally well. He has a realistic skill and driven anger that makes the fights very raw and intense, overkill is achieved at certain moments but even when it happens you feel the film has 100% earned the right to use it. The exposition is perfect, it’s exactly what is should be to build intrigue, and never in my life have I been more intrigued and excited to find out more information about a character- it keeps you pulled in until the action can start. As an audience the film baits enough evidence in front of you to say that yes, this man is important, no you don’t know to whom, or why, or what for yet, but you know that he pretty much has a pass to do whatever he wants and he seems to have earned this respect for being the textbook definition of a badass unstoppable legend among men in black suits with big guns. He represents consequence in this film, (unlike Nightcrawler). He represents the inevitable consequence that comes upon those who deserve it. 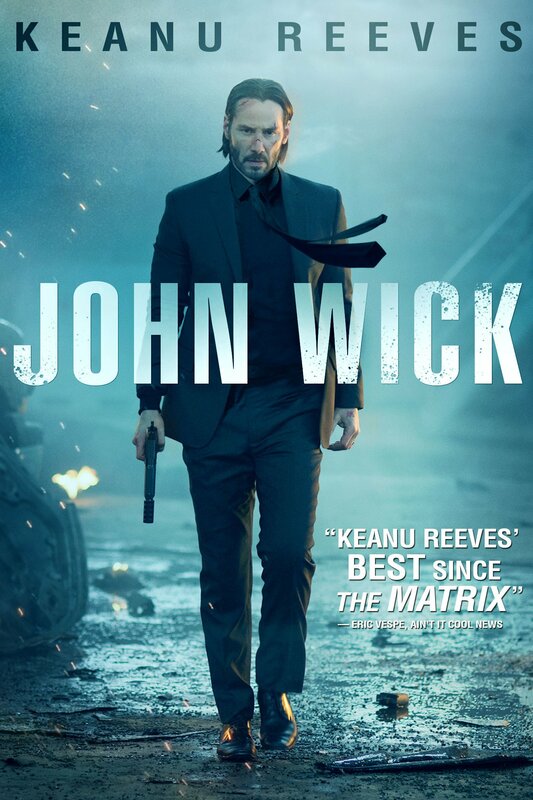 Quietly living a life that he wanted and recovering from a terrible loss, John Wick is a mystery man who has no desire to get in anyone’s way until he is dragged back in by a need for balance. Because this film is still relatively new we will keep this spoiler free, but there is a moment in it when you truly get the sheer symbolism and metaphors the movie is using him for to show off something beyond the villain’s control- consequences come and are followed by lightning, lightning throws itself around during his final attack as appears just like a force of nature to do what he has to no matter what gets in his way. As if this piece needed any more praise from me I must add in credit for the world building that goes on, a lot of the film happens in both a physical place and a contextualized set of rules that these professionals of the industry have. It is clear that the protagonist is both feared, respected and extremely liked by all of the characters in the film and it really gives you the sense that you’re watching a legend return to the field at the dismay of those he’s after and the joy of those he associates with. A lot of the world building actually reminded me of Pirates of the Caribbean (not only because the franchise shares an actor with this movie) with this code and rule set that these ruthless people live by and can communicate with each other over, also a central hub, safe from the public that this industry can unwind and operate in- which in PotC is Tortuga, and the pirate’s code.